“Over the years, the Lymphoma Research Foundation Golf Invitational has become one of the hallmark fundraising events for the Foundation and a highlight on the Metropolitan New York golf calendar,” said Steven J. Prince, LRF Chairman of the Board. The Lymphoma Research Foundation (LRF) – the nation’s largest non-profit organization devoted exclusively to funding innovative lymphoma research and serving the lymphoma community through a comprehensive series of education programs, outreach initiatives and patient services – is set to return to the esteemed Quaker Ridge Golf Club in Scarsdale, New York on May 23, 2016 for its annual Golf Invitational. Hosted each year at Quaker Ridge, the event represents one of Metropolitan New York’s premier charitable golf outings, raising over $263,000 last year in support of the Foundation's mission. The par-70, 7,008-yard was recently named the 71st best course in the United States in the 2015-2016 Golf Digest rankings. 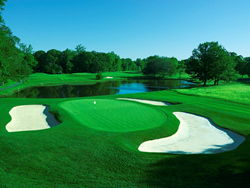 To date, Quaker Ridge has hosted three Met Opens, three Met Amateurs, and three Met PGA Championships. The event’s festivities include lunch, golf, cocktails and dinner at Quaker Ridge Golf Club, with foursomes available for $6,000. Signage sponsorship opportunities are still available starting at $10,000, including course entry. Registration begins at 10:45 a.m., followed by lunch and time on the Quaker Ridge driving range at 11:00 a.m. The shotgun start will begin at 12:30 p.m., followed by a cocktail reception and award presentation at 5:00 p.m. This year’s Golf Invitational is co-chaired by Steven J. Prince, Chairman of the Board of Directors for the Lymphoma Research Foundation and James A. Stern, Founder, CEO, and Chairman of The Cypress Group. For additional information on the LRF Golf Invitational, please contact Taylor Zitay Kahn, Director of Distinguished Events at tzitay@lymphoma.org or at (646) 465-9103 or visit lymphoma.org/golf. The Lymphoma Research Foundation (LRF) is the nation’s largest non-profit organization devoted to funding innovative research and serving the lymphoma community through a comprehensive series of education programs, outreach initiatives and patient services. To date, LRF has awarded more than $58 million in lymphoma-specific research.